Some people really want to get their hands on the new Call of Duty early. In the first attack the thieves used a car to block the road the truck was taking, causing it to crash. The drivers then apparently got out to "make a report," at which point they were attacked with tear gas. While the drivers were incapacitated, the masked men stole the truck, which was thought to contain around 6,000 copies of the game. A second truck, bound for a store in the Yvelines district was attacked by a trio of thieves, who threatened the drivers with weapons, and again made off with the vehicle. It's not known what happened to the copies of the game, although it's not hard to imagine them being sold on to hordes of excitable Call of Duty fans eager to get their hands on the game a few days early. After all, someone already paid over $1700 for an early copy of the game, and it wouldn't surprise me if there were plenty more where he or she came from. 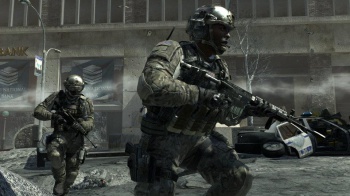 Call of Duty: Modern Warfare 3 comes out for PC, PS3, Wii, and Xbox 360 on November 8th.